Anarchy is the knuckle-whitening third novel in Stewart Binns' The Making of England series. Ruthless brutality, greed and ambition: the Anarchy! The year is 1186, the thirty-second year of the reign of Henry II. Gilbert Foliot, Bishop of London, has lived through long Henry's reign and that of his grandfather, Henry I. He has witnessed the terrifying civil war between Henry II's mother, the Empress Matilda, and her cousin, Stephen; a time so traumatic it becomes known as the Anarchy. The greatest letter writer of the 12th Century, Folio gives an intimate account of one of England's most troubled eras. Central to his account is the life of a knight he first met over fifty years earlier, Harold of Hereford. Harold's life is an intriguing microcosm of the times. Born of noble blood and legendary lineage, he is one of the nine founders of the Knights Templar and a survivor of the fearsome battles of the Crusader States in the Holy Land. Harold is loyal warrior in the cause of the Empress Matilda. On his broad shoulders, Harold carries the legacy of England's past and its dormant hopes for the future. 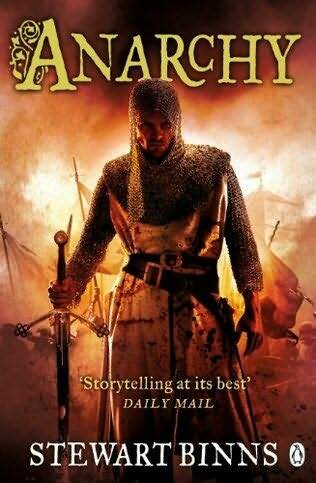 Stewart Binns' Anarchy is a gripping novel in the great tradition of Conn Iggulden and Bernard Cornwell, and is the third in The Making of England trilogy, following Conquest and Crusade. Anarchy by Stewart Binns is a powerfully told story through the eyes of a 12th century letter named Folio. The tale he tells is about a remarkable man named Harold of Hereford. Of noble blood, Harold is one of nine knights who founded the Knights Templar. Harold is a savvy, cunning, and talented knight who throws his full support and loyalty behind Empress Matilda. The plot moves at a fast pace, with plenty of intrigue, conflict, and well-drawn out scenes that kept me flipping pages to learn what happens next. The novel’s characters are portrayed humanly, with all their faults and virtues, making them very real in the reader’s eyes. The author is exceptional at storytelling. It is gripping and authentic while he expertly weaves in historical details pertaining to this period in England’s rich history. Even Robert of Hode (aka Robin Hood) makes an appearance with great believability. Although this is the third book in the Making of England series, this book easily stands alone and it is not necessary to read the previous two novels. But rest assured, this book was so delicious of a read, stunning, a blockbuster of an adventure, that I am eager to read the other two. Stewart Binns is a talented author whose books read like a movie, allowing the reader to deeply immerse themselves in the tale he tells. Gripping, real, poignant, this is a book not to miss. One I highly recommend.